Capturing the essence of blooming springtime and bottling it into the perfect scent to lift your spirits on a journey of sheer joy is what I experienced with Crabtree & Evelyn Lily of the Valley collection. As I opened the box of three products I was sent to review, I quickly lost myself in sensation as I floated away with the romantic airy floral blossoming with fresh-scented woods, dewy greens, velvety mosses, notes of hyacinth and ylang ylang wafting toward me, enticing me. 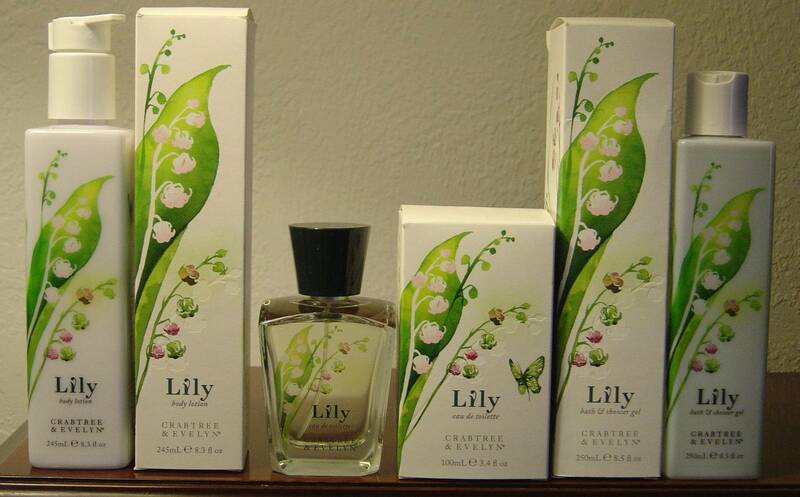 Like an addict, I reached for the Crabtree & Evelyn Lily of the Valley Eau De Toilette and sprayed my wrist and neck. The scent against my skin reminded me of walking through a lush undiscovered garden with nothing but beauty and happiness surrounding me. Later that evening, I indulged my senses more with the Lily of the Valley Bath & Shower Gel. Relaxing in my tub with those fragrant bubbles, I felt once again transported to that special, private garden reserved just for me. After I finally emerged from my tub, I treated myself to that luxurious Lily of the Valley Body Lotion, which scented my skin with that exquisite, mind-boggling fragrance while that rich lotion moisturized with shea butter, evening primrose, almond and coconut oils. Honestly, I adored this Crabtree & Evelyn Lily of the Valley collection because it did have the power to evoke a happy feeling in addition to being just a beautiful scent. This treasure of a fragrance would make the ideal gift especially with Mother’s Day approaching! I would love to try Crabtree & Evelyn's La Source Jewel Box or the Citron, Honey and Coriander 60-second Fix for Hands. I garden extensively and my body and/or hands would surely be appreciative. I subscribe to the Nuts for Stuff blog via email. I subscribe to Nuts 4 Stuff in My Yahoo Reader. …would like to try C & E's WEST INDIAN LIME BODY WASH !senorpiero [at] yahoo [dot] comGFC Follower: Brian E.
Tweet: http://twitter.com/#!/brianpiero/status/62454880329150465senorpiero [at] yahoo [dot] comGFC Follower: Brian E.
"Like" Crabtree & Evelyn on Facebook: bryan easonsenorpiero [at] yahoo [dot] comGFC Follower: Brian E.
Following Crabtree & Evelyn via Twitter: @brianpiero senorpiero [at] yahoo [dot] comGFC Follower: Brian E.
GFC follower: Atreau.I would love to try the Iris Eau De Toilette Traveller.